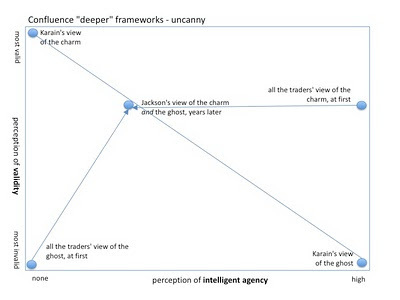 I've been thinking all week about the uncanny framework I wrote about last week (it seems to want to be called that). I have to say, this has been a slippery beast to fight/dance/play with! I keep being reminded of Jacob wrestling with the angel, and of holding onto greased pigs, and of fish slipping away from my grasp, and of bars of soap slipping out of my hands in the bathtub. I've only done one of these in real life (I'll let you guess which) but my point is that this framework is uncanny in more ways than one. I must be on the right track. Tom Graves, who has been generous in talking with me about previous versions of this framework (it was a mess to start with), posted some very useful comments to the last post. Some of them were useful because they were insightful, and some were useful because they misunderstood my intent. I've also gathered some useful insights and misunderstandings from others around me since (yes, that is code for "I cornered my poor husband yet again"). A bit of unsolicited advice to all the other framework builders out there: When you are developing ideas, treasure your misunderstandings. They are pure gold. They are not, as some think, proof that your audience is stupid and not worth designing for. They are valuable, irreplacable insights (and usually, evidence that your work needs more work). However, abide by the old rule of software design: listen to your users, but don't do what they say. When people misunderstand and propose alternatives, treasure the misunderstandings but beware of the alternatives. When you design software you see this all the time. People say things like "I wish I could see these things sorted by size and relevance. You should [do something that would make the program worse]." This is not because the user is stupid; it's because they can't see inside the program and into all the other objectives and plans and structures you are juggling. But hold on to those misunderstandings! I'll limit myself to explaining just a few of the most useful things I've learned since the last post. Predictability is confounding. For some reason on this particular framework extra axes have kept creeping in unnoticed. I think I've discovered and extricated something like six extra axes lurking in the shadows. (It's downright uncanny!) I don't think we need a predictability element here, since by definition in the uncanny area predictability is low. So we can put that aside. Explanation is misleading. Even when I try to say that the purpose is not to "pin down" anything, I think the word "explanation" leads people towards it. I'm thinking the word "perception" is better, because it makes it clear that we are talking about what people believe about what they see, not what they can prove to others. When Tom started talking about objective and subjective, I knew something had gone wrong, since I meant for this framework to map only subjective interpretations. Objective truth doesn't enter into it, except as one more perspective (the most universally accepted one). That doesn't mean I think there is no objective truth in uncanny patterns of sparse connection; it just means that defining and declaring what is objective isn't as useful in this context as exploring the universe of perception. Color doesn't work for validity. Tom rightly pointed out that even though you can use color coding for validity (as a way to squeeze another dimension in), it creates a simplifying effect and also reduces your ability to talk about change. In retrospect: of course, of course. I see it all now. 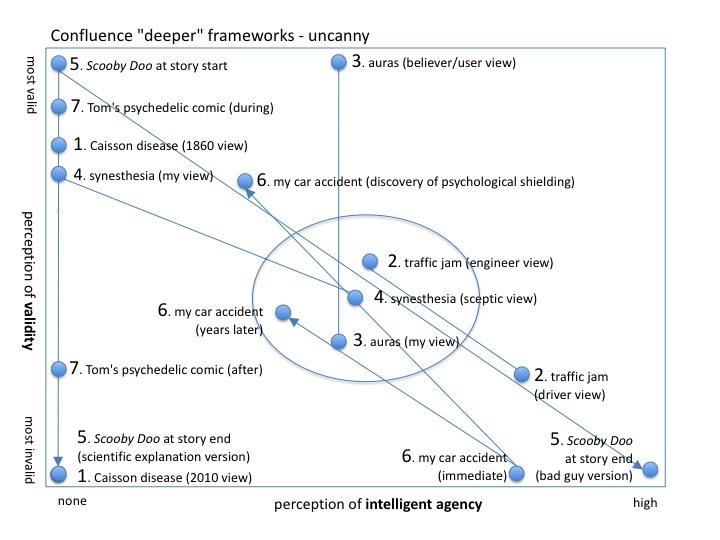 This graph has the perception of intelligent agency going from none on the left to high on the right. This is a blended axis where the inanimate forces of nature mix (in the middle) with the animate forces of agency. You may recall that I previously had these as two separate axes. Why did I collapse them into one? For two reasons. First, I needed an axis for the perception of validity, because I needed people to be able to draw movement in it; so something had to go. 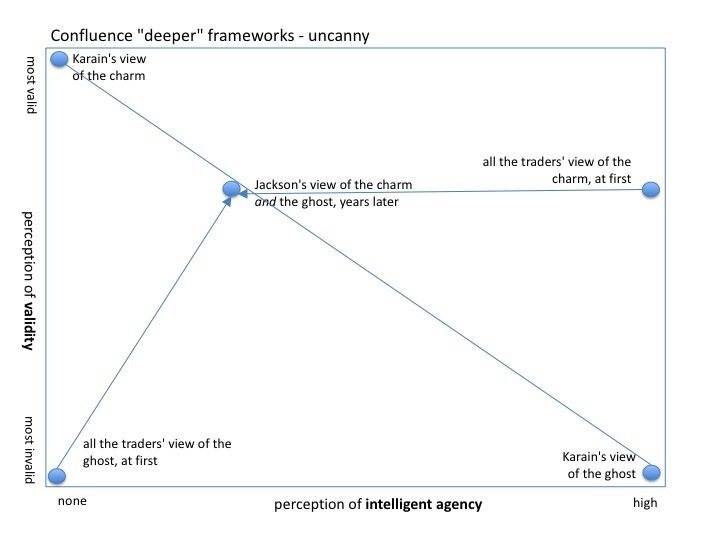 Second, I noticed that in my earlier mystery-agency graph, the lower left corner (low agency low mystery) left the uncanny framework entirely and moved into the areas of confluence where things become predictable. That didn't suit the purpose of the nested framework. So if that corner was not needed, I could merge the two dimensions and consider relative balance. Now I'll do the same thing I did the last time: go through each extreme corner, then try a bunch of stories and viewpoints out on it. Remember (as I forgot to label the last time) that these descriptions fit the extreme corners of the space, not large areas of internally uniform space. Perceptions of invalid mystery (lower left corner). This is the point where no intelligent agencies are perceived to be operating, but what appears to be operating is not a real phenomenon either. It is an illusion, a confusion, a distraction, a false start, a dead end. It doesn't add up, it doesn't hold up. Here is where I would put phrenology, the geocentric solar system model, Luminous aether, and other scientific mistakes -- from our perspective today. In their day, these phenomena did not qualify as uncanny because scientists thought the phenomena were understood, except for a few niggling details that would not come right. 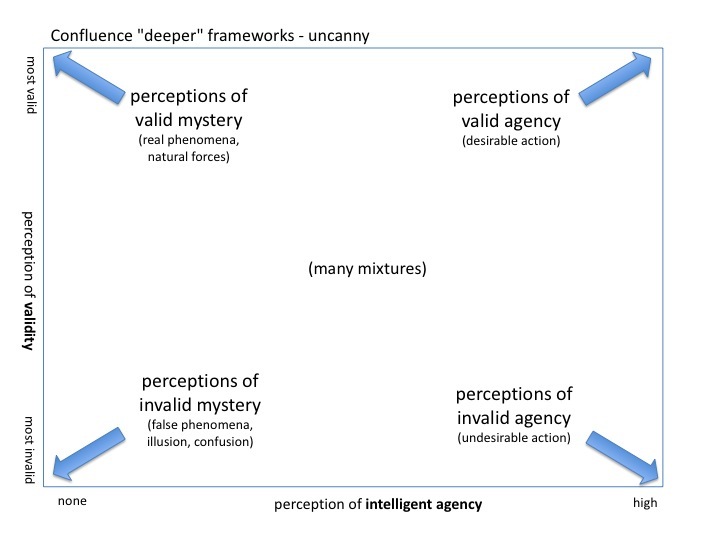 Perceptions of valid agency (upper right corner). 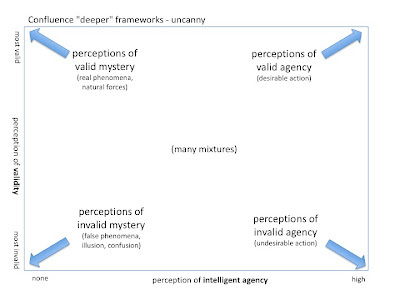 On the side where intelligent agency is strongest, what matters most to validity is whether the agency is desirable (safe, functional) or undesirable (dangerous, dysfunctional). In this corner an agent has a positive impact, even though their action is uncanny and appears to "come from nowhere." I'm not sure I should have said before that "this is the area of recipes and instructions" because uncanny agency cannot be so easily described and passed on. (You see, I slip out of the uncanny too -- I think we all have an instinct to avoid it.) This corner is more like when a person has a force that is undeniable but inexplicable, like a great speaker who moves people to action but can't explain how they do it. You could say that this corner will never be well populated, because how could uncanny agency not include natural force? But again you would be descending into definition. I can imagine situations in which a person perceives uncanny patterns to be attributable to strong agency -- God, for example. God doesn't need "natural forces" to impact things; He just commands and the universe turns on a dime. The fact that my perceptions will not often enter that corner does not invalidate the framework; it proves its utility, in fact. The whole point is to consider perceptions you do not perceive, so as to get closer to making decisions that take into account views you do not share. Having defined our space we can now go back to our items from the last post, with a few extra ones thrown in to make eight. I've arranged these so that the first four items are multiple-perspective comparisons, and the last four are bona fide stories. 1. Caisson disease. Back to this useful case again. In 1860 when the doctors and bridge builders were watching their men come back sick and dying from the caissons, they saw the phenomenon as high in natural forces, but beyond their current science: valid mystery. I wouldn't put their perception at the very corner, because they did have a few smidgens of explanation, such as that large men suffered more than small "wiry" specimens, and they tried to use those tidbits of understanding to help those affected. Our view today of what happened then falls into the extreme corner of confusion: they couldn't see what we see, so the men suffered for what seems like no reason today. Many perceptions of the behaviors of others fit near this corner. In fact, it might be reasonable to call this corner and the lower right the "knee-jerk" corners, because this is where perceptions land when people say things like "those people are unreachable" or "you can't trust people like that." I wonder if my placing the 1860 doctors there shows some prejudices on my part. We in the world of technology do tend to look down a bit on people in less informed times, don't we? Perhaps we lose something by it? 2. Traffic jam. Here my caricature of an irate driver thinks the situation is invalid and undesirable, but mainly because "some idiot up there" did something stupid. And my caricature of an enlightened engineer sees the situation as closer to desirable (from his helicopter he can see that the jam loosens up a mile ahead and the driver won't be irate much longer) and less a result of stupidity (things always jam up here on Friday afternoons). 3. Auras. Again we have the true aura believer and user, who places the phenomenon high in a mixture of functional agency (their honed skill) and real mystery. I, on the other hand, place it in a mixture of undesirable agency (con artists) and illusion/confusion. Note however that I don't drag the thing all the way down into total invalidity, though certainly some would. I follow the aphorism of "Keep your mind open, but not so open that your brains fall out" which describes well my middle placement of the dot. 4. Synesthesia. I see the phenomenon of synesthesia as high up in valid mystery, though some people might not place it into the uncanny framework at all. It's possible that I only place it here because I learned about scientific explanations of synesthesia after experiencing it personally for some decades. Perhaps people just finding out they have it now, say when they are ten, but immediately finding scientific explanations for it, would not place it here at all. A synesthesia sceptic (and yes there are people who disbelieve current scientific proof, given that it has not always been proved correct) might place the phenomenon closer both to invalid agency (self-promotion) and invalid mystery (illusion/confusion). By the way, have you noticed that in three out of these four multi-perspective situations, where a sceptic or generally not-very-involved person has had a perception, the perception has inhabited the middle area of the space? It makes me wonder if distance from a perception creates a sort of comfort with ambivalence, in the does-it-really-matter sense. Perhaps when you are close to a thing it is more likely to take up a stronger position. 5. Scooby Doo. As I mentioned before, every (old) Scooby Doo episode started with the team encountering some apparently bona fide (valid) mystery. And every episode ended either with a bad guy being carted off to jail or Fred giving a lecture on some obscure scientific phenomenon. I can draw the start of the story as at the upper left, in valid mystery, and the various stories splitting and going off to either extreme dysfunctional agency or a revelation of illusion or confusion. The fact that these stories inhabited only the extremes (at least in my memory) demonstrate how the show was a grand and fun caricature of life. 6. My car accident. This is a new one and one I'll have to explain a bit. Many years ago I bought a car. I was very proud of this car. It cost four thousand dollars, and it was only four years old. (That both dates the story and explains what sort of car it was.) I bought it at an actual car dealership. I beamed with pride. I changed the oil myself and washed it frequently. One Christmas my sister (who shall remain nameless and blameless) came to visit and a strange series of events unfolded. First, she put something big in the back of the car and closed the hatchback on it, shattering the window. Fine, anybody could do that, we got it fixed. Then we went to the city where she lived, and somebody promptly smashed one of the side windows and stole our Christmas presents. We got that fixed. Then we started to drive to my parents' house. Because I was still having a lot of back problems at the time, I let her drive, which in retrospect was a bad idea because living in the city she had grown unused to it. Middle of the night, rainstorm, poorly marked road with crossing railroad tracks that appeared to be a fork in the road, and soon after we found ourselves crashed in a forest. We were fine aside from my strained wrist, so luckily (or mercifully) that is not the point of this story. The point is what happened during the few seconds of the accident. It's probably one of my best uncanny stories ever. When I saw that my sister was rapidly losing control of the vehicle -- I'd felt that swish swish Swoosh SWOOSH before and knew what was coming -- I said to myself, "I'll relax. They say you should relax." So I laid my hands in my lap and relaxed. From the marks we found afterward, we could reconstruct that the car rode the guard rail for something like a hundred feet, apparently pirouetting once or twice, and then ripped through something like a dozen small and medium-sized trees before coming to rest on its side, with a tree-sized dent about one foot in front of my legs. Every single window was broken, including the two we had just replaced, and the rear view mirror was in the back seat. There must have been a terrible clamor. Here's the uncanny part: I remember it differently. I experienced this wild ride as a peaceful drift through space, gently wafting down without a sound into the forest. It was almost beautiful, really, the way the trees spread their arms to receive us. And the other weird thing is that my sister insists that I told her out loud to relax, and did. I'm sure I didn't. 8. Karain. This last story is one I recently stumbled on serendipitously, and it fits perfectly. It is a short story by Joseph Conrad, and I only found the book it is in because I was on my way to the bath and haunting my fiction shelves looking for something, anything, I hadn't read. Sadly this story has no Wikipedia page as of yet (can you hear me Wikipedia), but you can read the story here. I'm giving this story more space because it seems like it was written precisely to work with this framework (oooooh, uncanny). Let me see if I can summarize the powerful story briefly without trashing it. Three travelers, gun-runners selling illegal firearms to natives, repeatedly visit a small native village in some sun-bleached Asian paradise. The leader of this village is a man called Karain. He impresses the traders with his overpowering authority, strength and self-confidence. He seemed too effective, too necessary there, too much of an essential condition for the existence of his land and his people, to be destroyed by anything short of an earthquake. He summed up his race, his country, the elemental force of ardent life, of tropical nature. ... He gave [his people] wisdom, advice, reward, punishment, life or death, with the same serenity of attitude and voice. He understood irrigation and the art of war--the qualities of weapons and the craft of boat-building. He could conceal his heart; had more endurance; he could swim longer, and steer a canoe better than any of his people; he could shoot straighter, and negotiate more tortuously than any man of his race I knew. He was an adventurer of the sea ... and my very good friend. Even as they marvel at the grace and power of this natural-born leader, the travelers also notice that he always keeps near him an old man who shuffles along staring at the ground. They ponder why such a powerful man should keep such a hindrance near him. Karain never moved without that attendant, who stood or squatted close at his back. He had a dislike of an open space behind him. It was more than a dislike--it resembled fear, a nervous preoccupation of what went on where he could not see. This, in view of the evident and fierce loyalty that surrounded him, was inexplicable. On one visit they discover the source of this fear. Karain refuses to see them for some days, pleading illness. Then one night he appears on their ship, bedraggled, thin, and in panic. And he tells them a story, something like this. Once Karain had a friend who was like a brother to him. That friend had a sister, and the sister committed the unpardonable sin of leaving the village with a white man. Karain swore to accompany his friend in order to deal justice to both the sister and the man, as was the custom. The two brothers traveled far and wide, but as they went, Karain began slowly to fall in love with the absent sister. She begged him for her life in his dreams and in his waking visions. Finally the two found the sister, and, unable to stop his friend, Karain instead shot him to spare the woman he loved. After this, Karain's friend began to follow him in death, to haunt and taunt him without mercy. The old man found Karain, spoke words of power and magic, and sent the spirit away. Now the old man was dead, and Karain was before them. Not one of us doubted that we were looking at a fugitive, incredible as it appeared to us. He was haggard, as though he had not slept for weeks; he had become lean, as though he had not eaten for days. ... Of course it had been a long swim off to the schooner; but his face showed another kind of fatigue, the tormented weariness, the anger and the fear of a struggle against a thought, an idea--against something that cannot be grappled, that never rests--a shadow, a nothing, unconquerable and immortal, that preys upon life. We knew it as though he had shouted it at us. Why does Karain come to the gun traders? Because they have something he can never have. With you I will go. To your land--to your people. To your people, who live in unbelief; to whom day is day, and night is night--nothing more, because you understand all things seen, and despise all else! To your land of unbelief, where the dead do not speak, where every man is wise, and alone--and at peace! "Give me your protection--or your strength!" he cried. "A charm . . . a weapon!" They respond with only confusion to this at first, but then Hollis, the youngest of the three, goes off to his bunk and starts rummaging around. Then Hollis reappeared, holding in both hands a small leather box. He put it down gently on the table and looked at us with a queer gasp, we thought, as though he had from some cause become speechless for a moment, or were ethically uncertain about producing that box. But in an instant the insolent and unerring wisdom of his youth gave him the needed courage. He said, as he unlocked the box with a very small key, "Look as solemn as you can, you fellows." "This is no play; I am going to do something for him. Look serious. Confound it! . . . Can't you lie a little . . . for a friend!" "This is the image of the Great Queen, and the most powerful thing the white men know," he said, solemnly. "I wonder whether the charm worked--you remember Hollis's charm, of course. If it did . . . Never was a sixpence wasted to better advantage! Poor devil! I wonder whether he got rid of that friend of his. Hope so. . . . Do you know, I sometimes think that--"
I stood still and looked at him. "Yes . . . I mean, whether the thing was so, you know . . . whether it really happened to him. . . . What do you think?" "My dear chap," I cried, "you have been too long away from home. What a question to ask! Only look at all this." He gestures at the hustle and bustle of agency all around them. "Yes; I see it," said Jackson, slowly. "It is there; it pants, it runs, it rolls; it is strong and alive; it would smash you if you didn't look out; but I'll be hanged if it is yet as real to me as . . . as the other thing . . . say, Karain's story." I think that, decidedly, he had been too long away from home. Aside from this being an amazing story well told, it presents a useful case for testing the uncanny framework. I'll give it its own canvas here. Karain's perceptions of the ghost and the charm are simple and extreme, as befits his role as a caricature of native belief. In his mind the ghost is an undesirable agent, and the charm carries valid natural forces from the world of the white man. Karain is correct in his assessment that his ghost can have no power over his unbelieving friends, for they inhabit an opposite corner to the one that haunts him. I pointed at the curved line of yellow sands. "He is not there," I said, emphatically, to Karain. "He waits no more. He has departed forever." We assented vigorously, repeatedly, and without compunction. The great thing was to impress him powerfully; to suggest absolute safety--the end of all trouble. We did our best; and I hope we affirmed our faith in the power of Hollis's charm efficiently enough to put the matter beyond the shadow of a doubt. They are feigning confidence, using the force of their benevolent action to propel Karain to a place they themselves have no wish to visit. In the coda to the story, the narrator meets Jackson and hears him admit that his perception of the story has drifted part of the way into true mystery. This is countered reflexively by the narrator with a retreat to the safe corner of perceived illusion. Of course by posing these questions to us, Joseph Conrad is asking us to place our own perceptions in the space. Notice how the story covers most of the space. 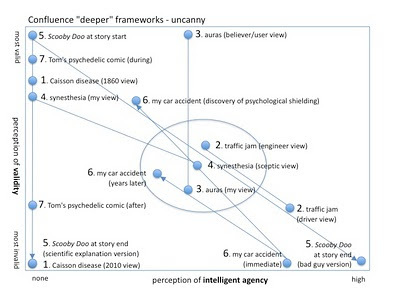 Like this framework aspires to do, it presents a canvas on which we can map our own perceptions of the uncanny in our world, and in other worlds, and thereby learn more about the world, ourselves, and those around us. In conclusion, I think this framework is starting to grow up and stand on its own. And as before I'm profoundly grateful for any feedback, insights, and perceptions. I am struggling to keep up with your thinking here, so to try to get it better, I read the Conrad story tonight. Thank you for pointing it out. I had never appreciated him as a writer before, but this story (and your discussion of it) was a revelation. There's so much stuff here, and one simple thing I keep thinking about is that the traders enter this strange land certain of what they know and over time it impresses itself on them; somehow they are no longer sure of what is true. Travel, in this case, helps to upset their preconceptions. And that's a beautiful thing. Uncanny, indeed! Thanks for the comment, John! Conrad is a bit over the top sometimes in his word choices, but you gotta love him anyway. He got at some deep things. I think people disgregard him, along with W. Somerset Maugham, because they reflected the colonial arrogance of the times. But if you can get past that, and we should, their work has a lot to say.